Puerto Rican food is hands down delicious! There's just something so perfect about rice, beans, fried plantains, and pique sauce. I cook my own variations of Puerto Rican food at home, and today I offer you my recipe for Puerto Rican nachos, which are GF and Vegetarian. They could easily be vegan without the cheese. We sometimes eat the rice, beans and plantains without the chips, or we make tacos and get our tortillas waste free from the taqueria. Simple is usually best, especially when it comes to food. (I'm also down to cook complicated recipes once in a while. I found "Mastering the Art of French Cooking" by Julia Child at a thrift store last year, which inspired a phase of time consuming, but very delicious eats. Most nights I'm extremely tired from work and school as I do both full time, so laboring over the stove for 4 hours is totally out of the question). Meals with less ingredients and steps are just as delicious and more affordable! After traveling to Guatemala twice and Costa Rica once, I developed an affinity for rice and beans. I haven't traveled to Puerto Rico, but it's on the list! I buy rice and beans in bulk by bringing my own cloth bags instead of taking single-use plastic ones. If you don't have access to package free food, opt for beans in a can and and rice in a paper bag if available (avoid plastic packaging). The Steps: 1. Add the oil to a frying pan and heat on medium for 1 minute. 2. Add the onion and cilantro and sauté for 2 minutes. 3. Add the rice, stirring it into the onion and cilantro. 4. Let the rice brown slightly in the pan and keep stirring it for 2 minutes. 5. Add the veggie broth or water and stir. 6. Bring to a boil, then put a lid on the pan and simmer until rice is cooked. Should come out light and fluffy! The Steps: 1. Put the beans, chopped potato or squash, cilantro and salt in a pot and simmer until the potato or squash is completely cooked. That's it! The Steps: 1. Add the oil to a frying pan and heat until hot enough for frying. 2. Peel the plantains and put into the oil. 3. Flip the plantains as needed to fry each side. 4. Plantains are done frying when they are soft, dark, and sticky. 5. Remove the plantains from the pan and drain on a cloth towel (avoid single use paper towels). I buy my chips and corn tortillas package free--check out my post. For shredded cheese, I bring my own container to the Taqueria and get a handful. The Steps: 1. Lay the chips out on a pan and top with cheese. 2. Bake in the oven at 400 degrees until cheese has melted. I grab a big bowl, fill it with rice and beans, and pour a delicious Puerto Rican hot sauce all over it. It's called pique sauce, and it's one of the items I still buy in packaging. It comes in glass bottle and is made in San Rafael, California by the Puerto Rican restaurant, Sol Food. 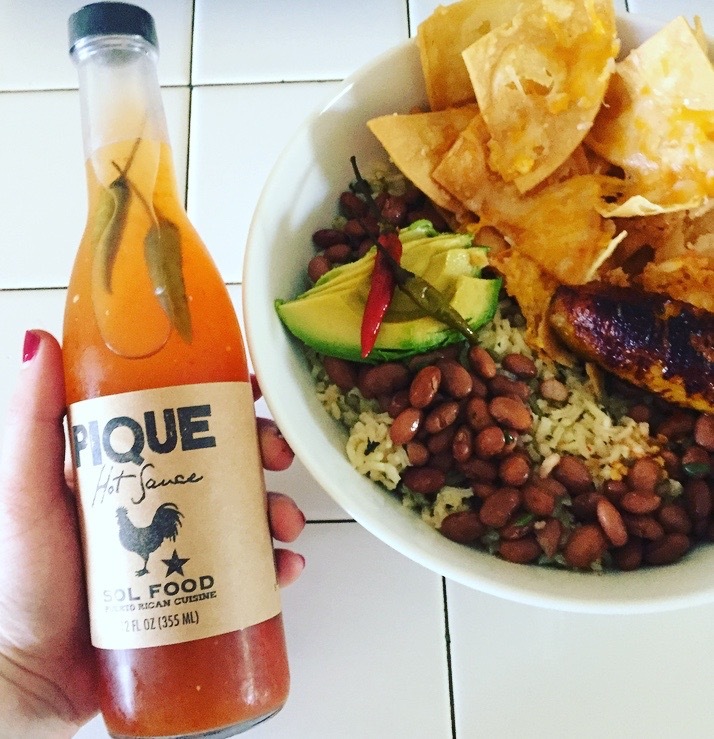 I haven't tried to make pique at home yet, as we still have 3 bottles left--it's that good! We also put it on our tacos and on our popcorn! Here is a recipe for pique sauce. I add slices of avocado to the rice and beans, and garnish with the plantains. On the other side of the big bowl, I put the chips. To eat, simply use the chip to scoop up all the goodness! Buen provecho.